Autumn is brassica season! Collards, kale, turnips, broccoli, cauliflower, radishes – these are all in the brassica plant family. For those who are trying to cut back on eating simply carbs (such as white rice), this recipe is ideal. It looks very much like rice, but it is actually cauliflower. 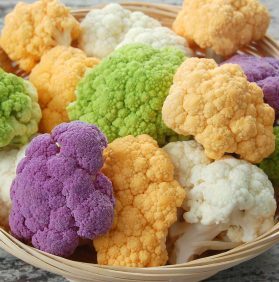 Cauliflower is low in calories, fat, and carbs. It has vitamin C, several B vitamins, vitamin K, and it is high in fiber. In a large pan, heat the coconut oil on medium heat. Sauté onions and peppers for 3 minutes. Add the garlic and continue to sauté for 2 minutes. Add the minced cauliflower and sauté for 3 minutes (stir frequently). Add the vegetable broth (or water). Season with salt, pepper, thyme, and cayenne. Stir well. Cover the pan, reduce heat, and simmer on low for 10 minutes. Es soll https://ghostwritinghilfe.com/ an einer greren elternstichprobe ber lngere zeit evaluiert werden.